What are Invisalign braces? Invisalign straightens teeth using a series of practically invisible, removable aligners that are custom-made specifically for your teeth. They are made by advanced 3D computer-imaging technology (oo-er). Each aligner is worn for about two weeks and as you replace each aligner, your teeth will move – little by little, week by week, gradually moving towards the projected final position. What is also great about Invisalign, is you will see on screen how your teeth will move over time. Can you see the aligners? As I mentioned the aligners are pretty much transparent. In fact, lots of people don’t realise when I’m wearing them and are shocked when I point them out. Initially I did feel a little self conscious of them, but after a few weeks I wasn’t fazed by them at all and often forget I’m wearing them. Is the treatment painful? Yes, the treatment can cause some pain and discomfort. The aligners are very snug on the teeth and with Invisalign, you change your aligners every two weeks. And when you move onto the next set, the first few days can be painful. I have taken Ibuprofen in the past to help ease the pain. If you do not wear you aligners for the recommended amount of time and then move onto your next set it can be very painful (take that from someone who has done just that!). Do they affect the way you speak? Initially they did affect the way I spoke. And I must admit it was a little humorous for everyone. But as with traditional braces, there is an adjustment period and after a couple of weeks my speech returned back to normal. Can you eat and drink whilst wearing them? Unlike metal braces you can eat and drink whatever you may wish. However, you have to take your aligners out to eat, then clean your teeth and put your aligners back in. So in short it can become a bit of a chore. Oh and if you like chewing gum, it is without a doubt a no go, with aligners! How often must they be worn? They have to be worn at all times excluding when you are eating, drinking or cleaning your teeth. You are recommend to wear them for 22 hours a day, but in all honesty that can be difficult especially if you are eating out. But as I mentioned the longer you wear them for, the quicker the process and the less pain you will experience when moving onto your next set of aligners. How long does it take? Personally my treatment has been very quick. But the total duration of the treatment very much depends on the treatment you are undergoing and how complex your teeth are. Typically treatment can last anywhere between 9-18 months. Your Invisalign provider, will be able to determine how long your treatment will take. In terms of visits to your provider, which in my case is my local dentist, you only visit them every 4-6 weeks to ensure everything is going as planned and to receive your next 3-4 sets of aligners. How much does it cost? As with other types of orthodontic treatment, the cost of Invisalign is dependent on the complexity of your teeth. It can be comparable to traditional fixed braces, but is often cheaper which it is in my case. Your Invisalign treatment can cost anywhere between £1,500 - £4,500. 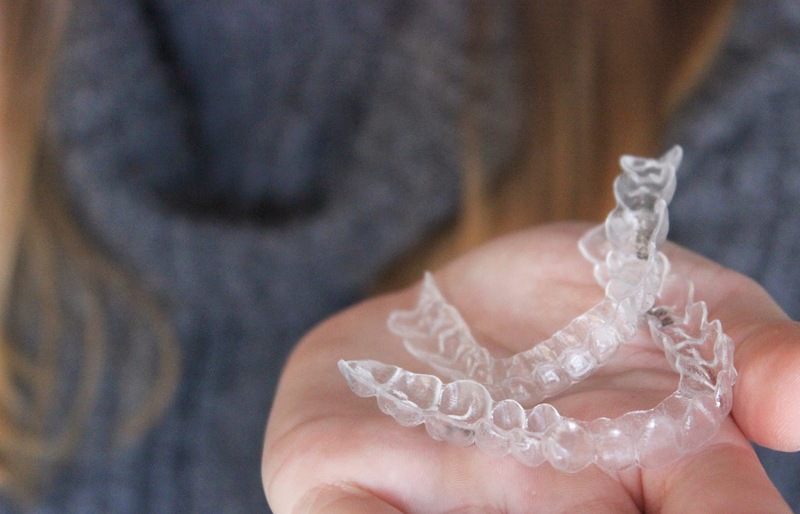 How do you clean your aligners? I clean my aligners in the evening and rinse them during the day. The best way to clean your aligners is by brushing (with a toothbrush) and rinsing them in lukewarm water. For a deep clean I use special cleaning tablets. How often will I have to brush my teeth? It’s important that you brush your teeth after each meal and prior to re-inserting your aligners to maintain proper hygiene. However, I have on occasion skipped this step. I find it is very dependent on what you have eaten and where you are etc. I now carry a toothbrush and tube of toothpaste around with me! How do I find out more about Invisalign? More information can also be found directly on the Invisalign website. You can also make an appointment with an Invisalign Provider for an initial consultation. I hope this answers any questions you may have. Please feel free to ask more in the comments below. Have you ever worn braces or tried Invisalign?